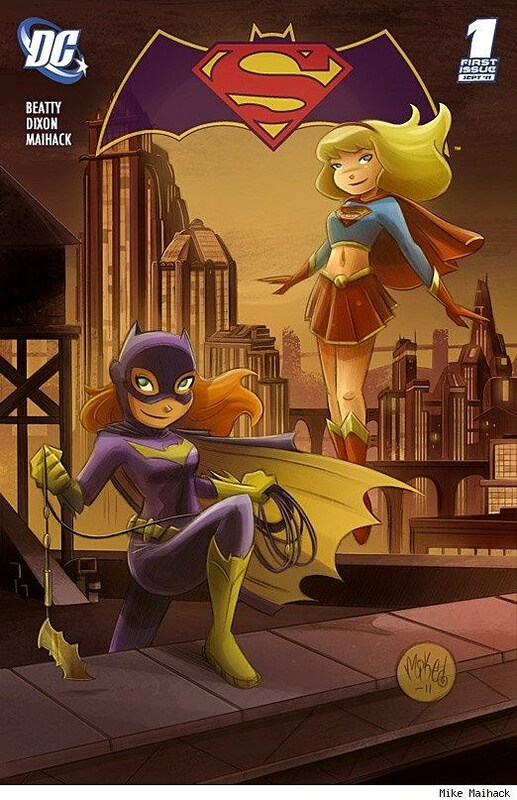 Mike Maihack's Supergirl/Batgirl #1 was among the standouts of DC Fifty-Too, a project led by cartoonist Jon Morris that saw independent artists from across comics and the Web create their own version of the DC Comics relaunch. Always a ComicsAlliance favorite and a regular guest star in Best Art Ever (This Week), Maihack's idea of pairing the Girl of Steel and the (Yellow-) Caped Crusader in an all-ages context is obviously one that many readers would be eager to buy, and he was encouraged by friends to expand on the concept with a one-page strip. In that story, which you can read after the cut, Maihack makes clever use of Supergirl's penchant for fashion. I really love how in the seventies Kara would change outfits almost every issue. It just makes sense in some odd teenaged superheroie kinda way. I grew up with two younger sisters that had more shoes in their closet than I had shirts. One look is not enough. And I think because of how iconic the colors and symbolization of Supergirl are (and because she's already had so many different looks anyhow) she's one of the few characters that could get always with it on a monthly title. Okay, maybe the logistics don't make sense. Maybe on top of the ability to fly and pummel bad guys into the earth, the yellow sun also made Kara an excellent seamstress. Or Martha Kent showed her how. Or Martha Kent makes them FOR her. Whatever the reason, I would bring that back. And I think it says a lot about her personality too. 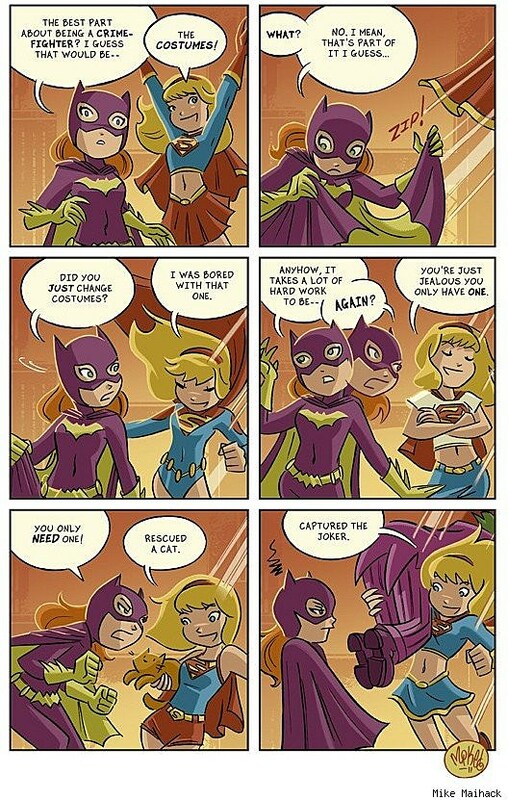 As for Batgirl, it's important to note she's not just a younger female Batman. Where Batman has become almost superhuman in his ability to do ANYTHING, Barbara has to work really, really hard to do what she does! I mean, she's naturally super bright, but I imagine she still trains and disciplines her mind and body to a ridiculous degree both day and night in order to not look like a complete fool fighting next to the likes of Batman and Nightwing cleaning up the gritty streets of Gotham City. And then along comes this wonder-teen from Metropolis who's able to do it all so effortlessly. And with better hair. That would be a fun relationship to explore. The following is Mike Maihack's original contribution to DC Fifty-Too, along with his remarks about that piece. For more on Maihack, check out ComicsAlliance's gallery of select artwork, as well as his website and Tumblr.